I've been in one of those moods lately. You know out-of-touch, blue, blah, itchy. I know the feeling well. It means that I'm on the brink of another huge change. The only thing to do is wait it out. I haven't even taken any photos for a couple of days, and that within itself is so not me. So, tonight, I snapped a few and feel better for having done so. Tomorrow I'm heading to Merom, IN to take some shots of their annual Chautauqua. Hopefully it will be a nice day. Anyway, I had to shoot this little guy. 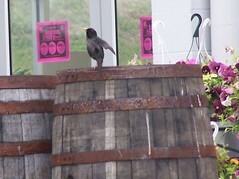 His little dance on top of the whiskey keg brought a smile to my face as I snapped away. Thanks for stopping by and for posting. I'm not so sure that there's really anything to teach. I just got lucky and caught this little guy doing his dance. My suggestion. Get a camera and take it with you EVERYWHERE. That's what I do because you never can tell when the ocassion to snap a photo will arise. I share you itchiness and the inclination that change is coming. It seems the world has been turning ever faster these last couple of weeks, and I have been helpless to do anything but sit still and wait for things to settle again. Some are great, some not so. I'm trying very hard to stay married right now. I'd appreciate if you kept that between us (and the rest of you folks that run across this and know who I am - the same). But in the end - changes come.